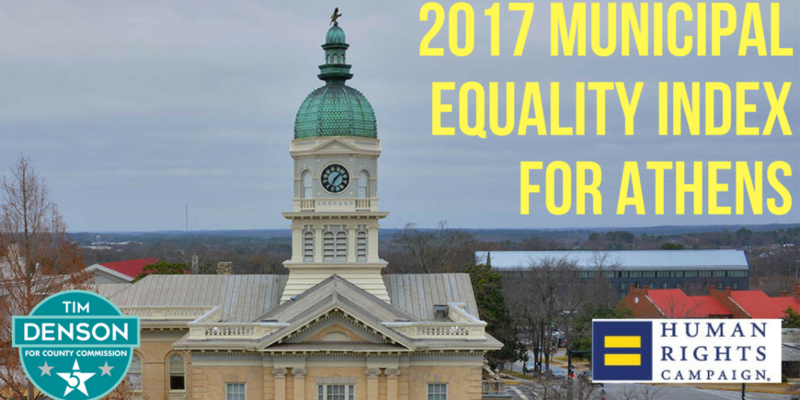 The Human Rights Campaign has released their 2017 Municipal Equality Index scores. Athens-Clarke County scored only 33 points out of 100. The national average is 57. The Human Rights Campaign (HRC) is “the largest civil rights organization working to achieve equality for lesbian, gay, bisexual, transgender and queer Americans”. 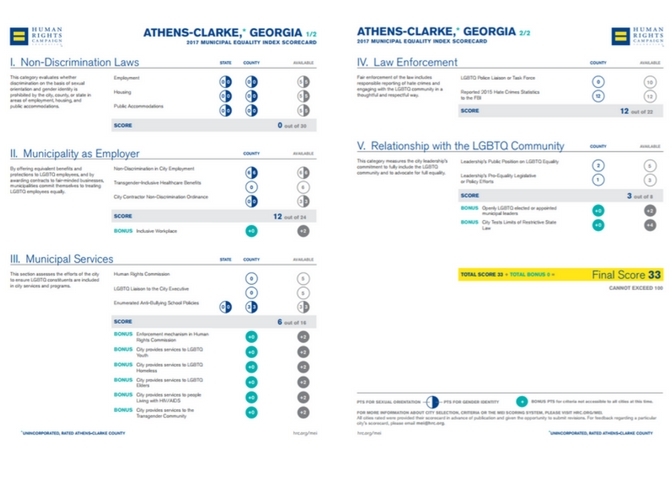 HRC has been publishing Municipal Equality Indexes for the last 6 years and Athens has been scored for the last 5. The index evaluates over 500 municipalities from across the US in 5 important categories and measures them against specific benchmarks and policies. In 2016, Athens scored a 21 out of 100. ACC received 12 points in the Law Enforcement category for reporting the 2015 Hate Crime Statistics to the FBI, something that they had failed to do the previous year. In every other category the ranking stayed the same. One easy way we can begin turning this around is to create an Athens Civil Rights Committee, something that is addressed in the report. This is something that we could do to create a more inclusive and welcoming Athens for the LGBTQ community but also of course for the black community in Athens. Tim has been advocating for these changes, along with the Athens Anti-Discrimination Movement and others, for nearly 2 years. If elected, Tim will make the creation of a diverse, citizen-led Civil Rights Committee a top priority. You can read more about Tim Denson’s ideas on social & racial justice here. Read the full HRC report here.